tumblers, while the light-fingered folk are operating upon their pockets behind. The county fair carnival, in time and space, occupies an important place in the imaginations and reactions of audiences. The fair broadcasts itself, sending out forerunners. Before the time it arrives, there are advance men with posters and arrows, newspaper ads, and prepared promises. On the way to the place it occupies and creates, audiences begin to experience sights — the rides, the lights, a tethered balloon, and the streams of traffic — and sounds — music, shouting, crying children, screams of riders, and the amplified talk of the pitchmen — as well as smells — animals and their excrement, dust, roasting meat, sugar, and hot fat. The entrance to the fair is guarded; there are gates and ticket takers, and these limits establish a zone, a space of changed rules, and different expectations. All the sensations which are broadcast into the surroundings are, inside the zone of the fair itself, intense, invasive, and uplifting. There is risk and possibility, fun and danger, the confirmation of what is mundane and allowed, as well as the challenge and violation of these same established norms and perceptions. There is also, at the fair, a performer whose natural environment this is. There is a performer who, by the nature of his art, most particularly represents and belongs to this environment. Standing on a small raised platform, wearing a microphone on a harness around his chest, the pitchman begins his spiel. “Step right up” or “Give it a try before you buy” (or even, for other types of pitchmen, “dearly beloved” or “once upon a time”). A crowd gathers, with one or two people, together, joining to start, and others, seeing them standing, joining them as well. In serried ranks, the crowd, the “tip,” begins to form — some close, some on the fringes, to be, if the pitch is successful, drawn in. The pitchman engages them, together and individually, and the nervous laughs give way to more involvement as the audience gives their attention and enters the constructed physical space of the performance. The audience may buy or they may walk on, but for a moment or more they are entertained, involved, engaged in the performance. Since 1993, I have visited more than twenty different fairs and have been part of the audience for over two hundred performances. I have photographed and recorded (audio and video) performances and performers and interviewed pitchmen and their audiences. As a literary scholar, I am interested in the goals and techniques of literary artists who translate the pitchman’s oral performance art into their written, literary art. As a folklorist, I am interested in the social and aesthetic dimensions of the pitchman’s specific contemporary, popular, oral art form. The fairs I observed, whether held in a street, a fairground, or a gymnasium, are set up to walk through. They are constructed as a pathway (or set of pathways), a passage to be traversed. There is no one place which may be identified as "the fair," because the experience of the fair requires movement through time and space. The booths are arranged along the sides of aisles, so that stopping to look closely, to touch, or to talk requires moving to one side, out of the flow of the crowd. This arrangement of a passageway with walls of booths promotes a certain pace, which I observed in myself at the first fair I attended. This pace is an even stroll, slower than normal walking speed, yet constant. The booths on one side flow by and are observed, but to stop and engage with any one booth requires a conscious effort. There is an observation of each booth, but very little involvement or real connection. Another element of the fair as a setting is one which is contained in the description by Thackeray which I quoted above. The diversity of the fair, the great number and variety of activities, purposes, and moods — along with the conflicts this type of diversity inevitably causes — are present as clearly at the fairs I observed as at Thackeray's fictional Vanity Fair. It is the conflicts inherent in this diversity, however, which I think are most significant. Between the crowds and the people working the booths (as well as within the crowds themselves), even in the friendliest exchanges, there was an undertone of distrust, a question of whether the deal at the fair was really fair, or the merchandise worthwhile, which would only rarely be found in other commercial exchanges. No one lives at a fair, and for the people who do live or run a business in the place where a fair occurs, the conflict and hostility (at least the inconvenience) may be even more powerful than for the crowd at the fair (see Kate Walter's Kate Walter, representing her Greenwich Village neighborhood, explored this in her New York Times piece, "Who Needs Street Fairs?"). 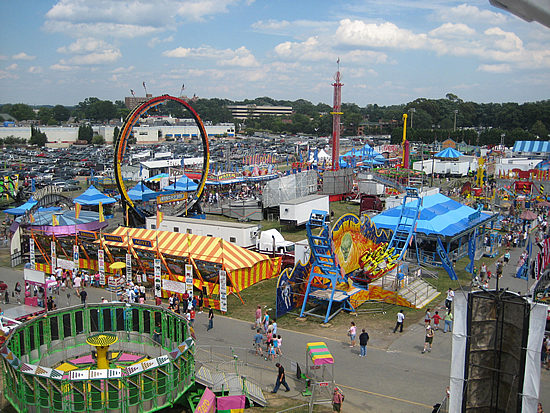 Fairs occur in a space that is made into a different place specifically and uniquely for the fair. The space is fenced and gated, with an admission charge and a ticket required for entrance. The fair is, physically and psychically, a separate zone. Everyone in the crowd who visits this place is a newcomer (a "yokel," according to Thackeray, or a “mark” in traditional carnival language). As newcomers, no one in the crowd, even someone those who lives right on the same street, is really at home. This fact is especially apparent at the county fairgrounds. Here, space — the fairgrounds — is set aside for these fairs. This space is usually on the edge of towns, on the margins. While it is set aside for the fairs, marking them as valued visitors, it is still space set aside for visitors also space set off as as separate from the “hometown” region. Most of the spaces sit empty and unused during the off-season. Even when the livestock and crafts contests are considered, we must remember that these are exhibitions of the talents and achievements of people (and animals) who are local to the counties, but not to the specific localities of the fairs themselves. The traveling, independent carnival operators (such as Reithoffer's Amusements or Amusements of America) who inhabit the space during the time of the fair are not locals. However, on the fairgrounds, even the locals are not locals, but the "carnies," in a sense, are. Connected to this outsider status, to the fact that no one lives at the fair, is the fact that communities, in a way, and to an extent, welcome the fair. Even when this welcome is contested, there is some perceived advantage, financial, nostalgic, or otherwise, in having the fair visit. The fair and the performance that belongs to it are familiar in form, although different at each instance; fairgoers know what to expect. At the same time, they expect to be surprised. The fairs return to communities, and the communities return to the fairs. "You know where the animals are," I heard one woman tell her child, "you've been here every year I have, and a couple I haven't." In addition, the fair is a zone of excess, and more particularly, of display of excess. From the grand flashing lights and blaring music to the sights and smells of huge amounts of tasty and aromatic food, the fair is where there is much of everything, and everything is too much for the senses. People stand and stare at this excess, watching huge roasts of beef and whole pigs turning on spits, giant Viking ships turning screaming teenagers upside down, and row after row of massive hogs, cows and cucumbers. More than watching, though, people join and become part of this display, buying and wearing large, garish hats, and carrying giant purple Chihuahuas, four-foot-long fluorescent pink inflated plastic bones, or clusters of three orange-headed wonder mops — "buy two, get a third one absolutely free!" All of this excess, its display, and the participation and inclusion of its audience, are elements of the fair as setting in which the oral performance art of the pitchman, with his display of verbal virtuosity, is inextricably intertwined. Many of the features of the fair as setting connect directly to features of the pitchman as performer. The job of a pitchman as a performer is an intense and challenging one. Many performances have to be presented over the course of a fair, and there is often no clear demarcation of the ending of one performance and the beginning of another. A pitchman has to catch the attention of his audience, hold it long enough for them to hear the pitch, and then close the deal. The appreciation for this type of performance may be expressed by laughter or even applause, but for the performer, the only really valuable appreciation is when the audience hands over some money. The pitchmen I observed were a diverse group of performers. They had varying degrees of skill and success in obtaining their audience's attention and appreciation, and varying degrees of engagement with their tasks. It became clear, as the research went on, that as in so many other artistic endeavors, there are far more pitchmen than there are talented pitchmen. I spoke at some length with several of the pitchmen I observed. Time is money for these performers, and time spent talking to a researcher is time not spent performing. I did briefly introduce myself and ask a few questions of all the pitchmen, although more than this was often impossible. Interestingly, the ones I spoke to longest — the ones who were willing, even eager, to take the most time away from their work — were also the ones who seemed to me to be the most skilled and successful. One woman, who was pitching chamois cloths at the Long Island Hunting and Fishing Expo, told me that she traveled and sold at fairs and expositions throughout the region and throughout the year. She was her own boss, buying the cloths wholesale, and had twelve people working for her, covering fairs that she was unable to attend. She was very aware of her own work as performance, and defined the main skills required. "You can't be afraid to talk in front of people. You have to be aggressive and be able to close. There are lots of people who can make the pitch, but you have to know just when to push for the sale. You have to be able to close." This ability to close, she said, was something that had to be sensed, a kind of intuitive performative skill. She was unable to train people in this skill, and when I asked her how she did train her employees, she told me that she really just gave them "certain information, the facts about the product" and let them develop the pitches themselves. As we were talking, she kept the microphone she was wearing switched on, but no one stopped walking by, no one paused to listen. After the interview was over, without noticeably changing her volume or tone of voice, she looked up and said, "Makes cleaning a breeze, you know." The difference between conversation (or interview) and performance was made completely clear: a man walking by with three children slowed and smiled. "C'mon over and take a look," she said. "Care for a demonstration?" The man came to a complete stop, glanced the other way, and walked over to stand in front of her booth. She began her pitch, and ended up with a crowd of eight or nine people, and closed it by selling four packages (at ten dollars each). I observed another example, a negative example, of the principle of sensing the moment to close in a young man with blue sunglasses pitching chamois cloth mops at the Chelsea fair. He gathered large crowds and had them laughing and responding positively to his pitch, but would perform for long periods (four to six minutes) without mentioning the price or asking for the sale. At one point, I saw a woman with money in her hand give up and walk away. The pitchman had missed the moment, failed to close, and the balance of the performance tilted away from him. At the opposite end of the spectrum, I observed and spoke briefly with a man pitching PermaSeal Shampoo at the Lower Columbus Avenue Festival. He told me he had only been to two previous fairs and was about to quit because, he said, "There's no money here." This pitchman was more aggressive than any of the others I observed — "Come over here, don't miss this one. You gotta see this. Best bargain at the fair. Special price today." His pitch drew larger crowds for the beginnings of his pitches. As he continued his pitch, however, and some people began to drift away (as I noticed happening with every pitch I observed, at every fair, to greater or lesser degrees), he challenged them with direct questions, "Hey, don't you want to see? All right, your loss." These questions never actually brought people back, and while he was challenging the drifters, more people, who had seemed involved, turned and left. On several occasions, he lost an entire crowd in this way. He had pushed the moment too hard and too soon, and, again, the balance of the performance tilted away from him. Part of the nature of oral performance art, its direct approach to a present audience that must be attracted and convinced to stay, requires an aggressive, almost hostile attraction. Audiences must be forced, and the force may be aggressive, but it cannot be aggravating. The pitchman must control an audience that is not necessarily amenable to being controlled. This presents difficulties for the performer and defines the performer's character and how he or she is perceived. All the pitchmen kept themselves, in some way, separate from their audiences. This separation was connected to the fact, which I discussed above, that no one lives at the fair, that the pitchmen are always and automatically outsiders to the community they visit, and only insiders to the zone of the outside, the fair. In Verbal Art as Performance, Richard Bauman notes "the persistent association between performers and marginality or deviance," and how performers are separate, "away from the center of…conventionality, on the margins of society." The pitchmen's separation was frequently physically marked. The pitchmen I observed were marked in some way, generally by their position behind a counter or on a podium or stage. Frequently, this marker of separation was embodied in a microphone, sometimes a large one with a colorful foam head, sometimes worn around the neck and positioned upright in the middle of the chest, and sometimes worn over the head and floating directly in front of the mouth. Other times, I noticed that the pitchmen I observed had some article of clothing or other personal accessory — cowboy boots, a bolo tie, an unusual hat or a heavy silver bracelet, for example — which was unusual and flamboyant when compared to the general appearance of the audience, and of the community in which the fair was taking place. This kind of physical marking was an embodied sign of a difference in status and regard which was noticeable and ambivalent. Pitchmen as performers, as someone on display in a contest for control, sometimes needed to present themselves as inferiors, asking for attention from a subordinate position, even setting themselves up as a figure of fun. At other times, even during the same performance, they set themselves up as superiors, with more knowledge and ability than their audience, even condescending to them. John, a water-race pitchman at the Dutchess County and Bloomsburg fairs, told me that he enjoyed working the water-race game particularly (he had worked several others) because of the numbers of children who played. "I especially like the little kids. I wanna pick 'em up sometimes, help them shoot. Parents don't really like it when I touch them." I had noticed this myself, in observing his and other games. Parents prevented children from coming too close to performers, showing a distinct uneasiness about even direct verbal contact. There is a sense that these performers, even those working the games most explicitly directed to small children (a game with floating plastic ducks, in which "every one's a winner," for example), are not really to be trusted with children. These performers have a need to balance aggressiveness and pleasantness, sensing the moods of their audiences. The different phases of their task – the drawing in, the holding of attention, and the close – must receive a delicately balanced rationing of time and skill. This balancing, along with its connected interaction with the audience, lies at the core of the successful practice of their performances, and it is a talent which may be separate from the actual content of the performances. These performers' need for control of their audience is a direct result of the live, oral nature of their art. This control is practiced with varying degrees, varying balances of aggression and flattery, by all oral performance artists. It has consequences and effects for the audiences and for the performances themselves. The performance of pitchmen at fairs, like other oral performance art, is characterized by particular textual features, most noticeably including repetition, rhythmically structured catalogues, rhyme, and alliteration. Pitchmen also use a kind of exaggerated language and emphatic overstatement. These features exemplify the pitchman's characteristic display of verbal virtuosity; they convey information but also delight and maintain a hold on the audience by the use of sound. All of these techniques and features, all of this virtuosity, are used by the pitchman to enable his successful control of the audience. "You have to have an answer for everything," the man pitching the Painless Hair Remover told me. As I observed, he had exactly that. Even more significantly, his "answers for everything" were generally neatly matched in sound with the audience's questions or objections, or the next point he wanted his pitch to reach. The use of stock answers to audience questions, challenges, and responses, of repeated formulas strung together differently and with the appropriate elements substituted into the appropriate slots, is an essential feature of all oral performance art. When an audience member interrupted a performance to ask, for example, whether the PVA mop would scrub up scuff marks from shoe heels, the pitchman's response to the challenge included three euphonious formulas, the "thirty-pound soaking-wet string-mop," "lefty-loosy, righty-tighty" and the "ketchup sandwich," which the audience had already heard several times before. This way of using the performance to control the audience, to allow for any of their responses, continued throughout all the successful pitches. The repeated phrases: "just like that," "make it damp, then you wipe," "thumb on top, that's where your power is," "one hand on the top, other hand goes on your handle, all you do is you turn it," and so on, are a familiar form to the audiences. They become expected and anticipated (sometimes even being mouthed or muttered along with the performer). They allow the audience to feel at home and drawn into the performance, as well as giving the pitchman a way to fill in gaps and make transitions in the rhythm of the performance. When an audience member asks a question or expresses doubt — "What if it breaks?" or "Seven dollars each?" — the pitchman can respond immediately with a phrase that the audience has already heard and is already prompted to accept — "That's not a ninety-day, not a sixty-day, that's a lifetime guarantee," or "It's not a matter of cheapness, ma'am, it's a matter of true, priceless quality." Another feature of the pitchmen's performances, which is also a recognized quintessential feature of oral poetry, as noted by Walter J. Ong in Orality and Literacy: The Technologizing of the Word and Franz Boas in “Stylistic Aspects of Primitive Literature,” among others, is the catalogue, a long list of items, linked together sometimes without connecting conjunctions, sometimes with repeated, not strictly necessary conjunctions. These catalogues work without logical coordinations, using a paratactic rather than a hypotactic structure. Oral catalogues derive their accumulated power and effect from their sound, the oral virtuosity they demonstrate, rather than from any logical, narrative or emotional sense. The PermaSeal salesman at the Bloomsburg Fair made extensive use of these catalogues, often drawing a smile or chuckle, and an extended stay, from an audience which was about to desert him. "It cleans Dacron," he began in one such instance, "also nylon, herculon, linoleum. Wool, wood, cotton, canvas, muslin. Rattan and bamboo, and Scotchguard and concrete...." The list went on even longer, although I could not write fast enough to record it all. When I asked him about this listing (he used others — types of stains, products you might try which wouldn't work, and so on), he said, "I just try to make it as long as possible. Sometimes I don't even know what I'll say next, but I try not to repeat myself." The elements in these oral catalogues often rhyme or alliterate, or are similarly aurally connected, presenting and emphasizing the pitchman's skill and verbal virtuosity. In addition, further emphasizing the catalogue as a virtuosic performance rather than a mere list, pitchmen frequently insert incongruous, unexpected and humorous elements, which emphasize, by interrupting, the aural flow of the catalogue. The EZ Chopper pitchman opens his bowl and puts in "cabbage, carrots, parsnip, potato, tomato, rutabaga, lemon and lime, and obviously I could put more but no one's gonna eat it anyway." These humorous elements are frequently hostile and insulting (at least mildly) or refer to the body and its functions in ways that are not generally considered appropriate or polite in public. The PVA mop, for example “picks up sand, salt, dog hair, cat hair, fish scales, toe nails…." Often the humorous elements of the pitchman's performance represent thinly veiled attacks on children, wives, husbands, parents, and, particularly, in-laws. With the Sportsman's Dream (a knife set) "you get the utility knife — you can use for PVC and carpeting or radiator hose and still slice that nice tomato — or my wife…. She uses it for bagels." The implication, that the utility knife can slice a wife as well as a nice tomato, cannot be left standing. The moment of hesitation, though, before the bagels are mentioned, and the pitchman's smile and the audience's chuckles, emphasize both the veil (the bagels) and the attack (the slice). These performances may skirt the boundaries, through humor and innuendo, of what is acceptable. The control the pitchman exercises is threatening to audiences, but some of this threat is simultaneously strengthened and diluted by redirecting it with humor. "Just checking if you're listening" is the way in which pitchmen often respond to audience's laughter at this type of humor, and this kind of response aptly emblematizes the way in which the pitchman's humor simultaneously diffuses and emphasizes the uneasiness provoked by this type of performance. Pitchmen also use, sometimes separately from these catalogues and sometimes simultaneously with them, other displays of verbal virtuosity. They use polysyllabic synonyms, rattling them off with mellifluous ease. They recite, with relish, drawn out chants and convoluted constructions that roll off the tongue. Their own pleasure in their artistic invention and enjoyment of it, of the creation of impressive sound, is one of the most definitive elements of their performance. Another technique used by pitchmen, like other oral artists, is storytelling. Many pitches I observed included long narrative segments, formulaically structured, with sequential plots, characters, actions and resolutions. Stories beginning with "I had a customer last year..." or "The other day a guy told me..." ended with "and he came back and bought a whole case this time" or "and after all that, he's still using the same drill bit." What came between these beginnings and endings, the narrative of past experiences, worked as good stories often do, to keep audiences listening and involved, to connect them to experiences and events. Often, the stories were brief, and the descriptions they included were presented in a kind of shorthand, with a small detail standing in for a lengthier passage. The descriptions and the stories, though, were extremely evocative, for reasons that are specific to oral performance art and its familiarity of form. These stories, and much of the pitchman's performances, contain specific references to places, events, dates, and people, all of which serve as referential pegs for the audiences. This technique is part of oral performance art's familiarity of form. When a pitchman says to the audience, "Let me tell you what happened just across the river in New Paltz" or "Right there in New York City, in Mount Sinai, they're ordering fifteen cases a week," he or she makes the performance seem more real and accurate and trustworthy, and gives the audience a feeling that the performance is tailored specifically to them. There is meaning immanent in these descriptions — they call to mind the entire constellation of connections the audience carries from previous stories and previous descriptions — and they can be adjusted by both the performer and the audience to each audience member. The audience knows that their life is part of the performance and the performance is part of their life — as real places they know and identify from experience are called to mind. When a pitchman's performance is at its best, there is an engagement, a working together of the performer and the audience, and the structured orally composed formulas of the pitch only strengthen and confirm this engagement. This case was eminently apparent in the performance of the chamois cloth pitch at the Long Island Hunting and Fishing Expo, where the woman told me, "When I'm really on, I know just what they're gonna ask, but I can't answer until they do ask it, so I'll just pause and wait for them to come in with the question." Without "them to come in with the question" the performance cannot work. The performance is co-constructed. While the pitchman is the performer, this role is, in the best pitches, actually shared with the audience, and both parties are active and essential. The key feature of the audiences for pitchmen's performances is one that I have already peripherally discussed in the contexts of the setting, the performers and the performances. The audience for a pitch is mobile, shifting, and far from guaranteed. The strolling pace, the browsing mode of fairgoers means that they must be stopped, their pace must be interrupted, in order for them to become an audience. I noticed on many occasions, every one that I observed, in fact, that the initial approach of a fairgoer to a pitch is tentative and punctuated by pauses. Sometimes people make the actual step (really a stop), and other times they pause only momentarily before continuing their stroll. Sometimes people stay for the whole pitch, sometimes they walk away before the close. One important aspect of this mobility is that the pitches' audiences almost always consult in some way before making the actual step into the role of audience. Two people will glance at one another, or a single person will look away, towards other people, as they approach the pitch. Joining an audience for this type of oral performance is a negotiated communal decision, which is undertaken in common with another person, not individually. Several of the pitchmen with whom I spoke expressed an explicit awareness of this to me. "Sometimes one is enough," one woman told me. "It depends on the flow of people, but you've got to get someone to break the ice. Once there's a few people listening, more will come." This communality is involved not only in the beginning of the pitch, but throughout its performance. In watching audiences, even when the pitch seemed most successful and engaging, I frequently observed a glance, away from the performer and toward other audience members. A person would look away from the pitchman, and briefly check, seeming to gauge the response of the person standing nearest. At first I noticed this in myself, and thought it was because I was there as a researcher, but as my observations continued I realized it was almost universal, occurring even when the person standing nearest appeared to be a stranger to the glancer. Being a part of an audience for a pitch, it would appear, involves being a part of a group, and being involved and concerned about measuring the behavior of the other members of that group. This glance is, I believe, subtly related to the outsider status of fairgoers which I discussed above. To be at a fair and to be in the audience of a pitch is to be engaged in an activity which, however familiar it may be, is not quite comfortable. There is a discomfort about being a "yokel," which is related to an awareness of the possibility of being cheated or taken advantage of. The pitchman's audience carries an air of caution, of guardedness, and seeks solidarity with other audience members to provide confirmation that it really is safe (and even that it is really morally acceptable) to listen and engage with the pitch. On one occasion, when a woman had just bought a Kitchen Magic at the Lower Columbus Avenue Festival, she turned to the stranger next to her and said, "You should buy one, too. It's a good deal, isn't it?" This remark brought about another sale for the pitchman and a satisfied smile from the first buyer. She had received the confirmation she needed to be comfortable with her purchase, and the stranger she addressed had received the confirmation she needed to make a purchase. Again and again at the fair, I saw and participated in interactions of this type, sometimes supporting the performer, sometimes banding together against him. In pitches where there is real cause for distrust (not, presumably, the ones included in this study), such as sidewalk three-card Monte games, it is common practice to hire a "shill," a confederate who poses as an audience member and provides this confirmation. I do not believe that anything of this type occurred at the pitches I observed, but it was certainly clear that the confirmation was needed, and that in successful pitches it did come. The undertone of distrust, of caution and awareness of dangers in the pitches' audiences was sometimes more than an undertone. As I have mentioned, questions and even direct challenges from the audience are not uncommon, and pitchmen must handle them. At times, these challenges went beyond subtle distrust into outright hostility. One well-dressed woman yelled furiously at the Kitchen Magic pitchman with his pile of sliced and diced vegetables and cheese, "You should give all that food to the homeless!" "Lady," he answered, "I haven't got the time. I'm tryin' to work for a living." While this was perhaps not the most effective response to audience heckling, it did get a laugh from the rest of his audience, and it did not allow the heckler to stop the pitch. It also exemplified the pitchman's most common style of response to outright hostility. He used a familiar (almost proverbial) phrase, returned her hostility by belittling her, and answered her directly. He did not insult her directly, which could have led to an escalation of the exchange. He continued the contest for control, using the heckler and his contest with her to engage the rest of the audience further, and redirected the audience's attention to himself. As Amanda Dargan and Steven Zeitlin note in "Turning the Tip: The Art of the Sideshow Carnival Talker," this type of response to hecklers is common — for example, talkers might respond with comments like "I remember my first beer." In one game in particular, "Soak the Bloke," this kind of hostility is thoroughly used to the “Bloke’s” advantage. In this game, the "bloke" sits behind a protective netting, above a tank of water, and taunts and insults his audience (sometimes, as the evening grows later, quite obscenely) to provoke their anger. The angrier they get, the more they want to spend money to soak him in water by throwing a baseball at a target, which, when struck, releases a trap door under his seat. While this game is atypical in the amount of anger, of insult, which is not just tolerated but desired, it does typify the ways in which this kind of response is provoked and then used to the performer's advantage. The audiences know they are being fooled, they know they are being provoked, but because it's "all in fun," they can be hostile and aggressive in a sanctioned forum. The expressions of people throwing baseballs at this "bloke's" target included some anger, but more a kind of embarrassed humor. Some of the roughest jibes (for example, a joke at the expense of a teenaged boy's overweight mother — “Whoooeee, thar she blows!”) provoked derisive laughter from the audience, as well as maniacal cackles from the "bloke," but no active hostility, beyond the sanctioned attempt to "soak" him. The pitchmen's audiences, although they share in the performance of the pitch, both among themselves and with the performer, are nevertheless engaged in a contest for their attention and appreciation. The control of the audience ultimately does belong to each audience member, but in joining together to become an audience, they share some of this control with one another, and more importantly, it is the pitchman's task to take it over for a while. They give up this control when they stay and listen, when they give their attention, their acceptance and ultimately their money, but it is never a complete surrender. There are resistances and rebellions, discomforts and distrusts, to varying degrees and with varying results. Oral performance art, with its performers, audiences, and performances, while it is often valorized and culturally sanctioned, as with African griots or Baptist preachers, for example, is also frequently marginalized and transgressive, as with gangsta rappers and beat poets. When people come to the fair, they are already coming to a site where this same contradiction exists. When oral performers and their audiences create their art at the fair, they are participating in a tradition, a tradition which has value to communities. This tradition includes elements of celebration and nostalgia, of community pride and esteem. In these elements, there are also negative sides. The community is defined and identified against an Other. Attitudes about the Other are reflected in the performers' attitudes about their audiences and the audiences' about the performers. The pitchmen who run children's games cannot be trusted with children, and the audiences who pay pitchmen's wages cannot be trusted with the products — "I only give them an empty container if they want to check the label. No sense taking chances," the Clenz-All pitchman, afraid of being robbed by an audience which was similarly afraid of being robbed by him, told me. Leslie Prosterman’s “The County Fair Carnival” recounts how people "lament" the "deterioration" of the "nice old" county fairs caused by the carnivals which ruin them. I would suggest, as her historical research concludes, that it is not the carnivals that "ruin" county fairs. The carnival is an integral part of the county fair. It is for both what is transgressive and what is valorized that people come to the fair. And it is both of these that people find in oral performance art. Oral performance at the fair provokes smiles and frowns, distrust and acceptance, trust and fear, exploitation and enjoyment, because that is exactly the function of the fair as a whole. These performances both define and reflect their specific nature and that of the culture and context within which they occur. In addition, oral performance art contains referential pegs, a familiarity of form and accessibility which comes from the fact that audiences simultaneously know what to expect, and do not feel entirely confident that what they will expect will occur (or will be pleasant or even acceptable). The past which is referred to in oral performance art is one about which the audience holds ambivalent feelings — nostalgic longing as well as superiority and anxiety. Oral performance art at the fair is a part of every contemporary landscape, in post-capitalist, transnationalist America, and it is part of the nostalgia for and rejection of what is "old-timey" as well. Because of the live human audience, there is also an interplay, growing out of the pitchman's contested control of the audience, which is always present in oral performance art. Richard Bauman refers to “the inherent sociability of performance." However, this sociability (like many other sociabilities) is a striving sociability, competitive and cooperative. There is a struggle for control — an unresolved, active striving for mastery — with the audience and the performer negotiating and together creating the performance. There is also, often, an outright and explicit reference to this interplay — “now I know you’re going to say…” In this way, the interplay is pointed out and pointed up, and the fact that the performer's authority is subject to question is emphasized even as those questions are partially and temporarily avoided or resolved. The contest between the performer and the audience also includes an emotional and moral charge. There is the fear of approaching the performer, the fear of allowing children to come near. There is the off-color or slightly risqué humor and humorous, occasionally vicious, personal insult. There is a tendency, variously expressed, toward violating or at least teasing out the boundaries of morally acceptable behavior. or by golly you win.